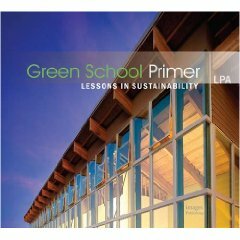 I was given a pre-release review copy of "Green School Primer: Lessons in Sustainability" published by the Images Publishing Group. At GreenHomeBuilding.com I am mainly concerned with residential architecture, but what better way to learn about the effectiveness of sustainable architectural principles than within a school building that was designed with this in mind? North Carolina State College of Design, so it is strongly supported by an important professional in the business." "The content looks to my appraisal to be very good and embraces the spectrum of Green, from energy to holistic planning, including the environment and approach to proper utilization and selection of materials. The book is focused on ten principles and presents them succinctly and clearly with supporting illustrations. It is not focused on the details of execution -- leaving that to the architects." "There is only so much you can put in 143 pages. It has a chapter on rating, but interestingly does not pursue the ultimate in energy efficiency, looking more on the total picture of green, healthy, and functional. LPA has designed or modernized 200 schools in California, some illustrated in the book." "In all, an impressive book! I particularly like it because this could not be published at a better time, when the Secretary of Education is supporting charter schools and has a big purse. This is a template for progressive thinking in school design." Rosana, my ex-librarian wife, has taken the data from book sales at www.greenhomebuilding.com over the last four years to create a convenient book store that features the top 350 books from that list. These are grouped into several topics, so browsing is easy. You can check out this new book store at hartworks.com/naturalbuildingbooks.